It’s about damn time someone was foolish enough to jump in Lob City! 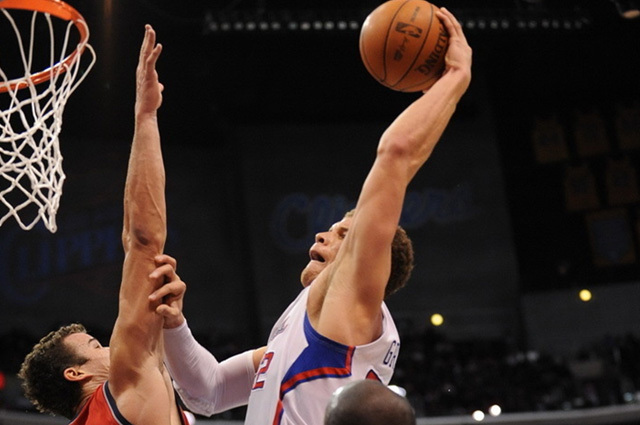 If you watch carefully as this play develops you’ll notice that Kris Humphris had a choice to make. Johan Petro was forced to leave DeAndre Jordan to cut off Randy Foye, and Humphries had to decide whether to slide down and cover Jordan or stay with his man, Blake Griffin. He elected to try to cover both players, but if you’re late rotating to Blake Griffin… forget about it. “OH YEAH!” That fan (or whoever that was) essentially reacted the same way I did, and at the same time, too. It was all over for Hump as soon as Blake caught the ball. I appreciate the hustle, but like I said, jumping with Griffin is simply a foolish decision. All you’re gonna do is add a foul shot. Honorable mentions to Rudy Gay and Chandler “The Cobra” Parsons, who struck again. It should also be mentioned that there was an unposted POTD on Sunday, Gordon Hayward on Corey Brewer. It’s been added to the list and given six faces.